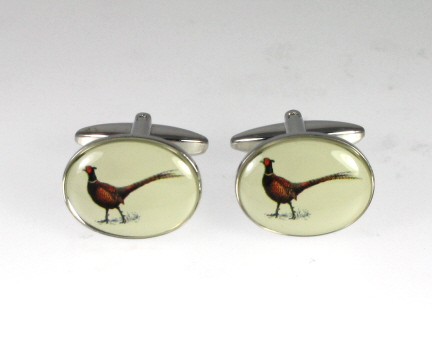 A pair of Pheasant Cufflinks with silver coloured fitments. Ideal novelty gift for country folk. An exquisite large handkerchief with pheasants in flight on a stunning blue and red swirling paisley background made from pure English silk. A pre-tied olive green bow tie with single pheasants repeat motif. Milled and stitched in the UK from pure English silk.